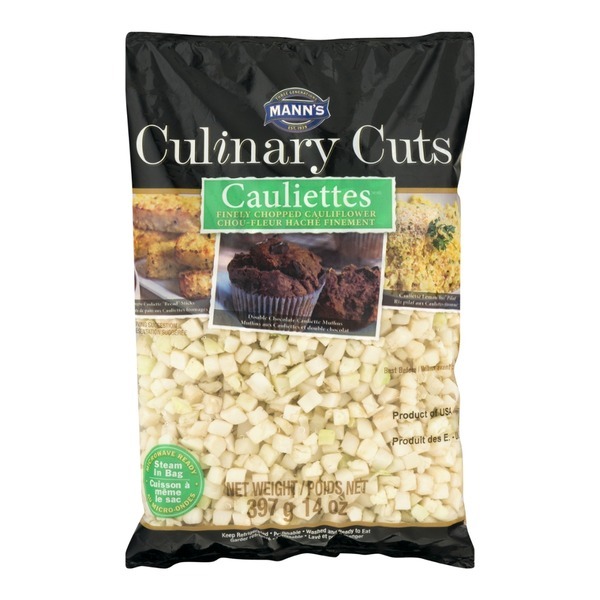 Mann's™ Cauliettes Culinary Cuts. Finely chopped cauliflower. Three generations. Est. 1939. Cheesy cauliette "bread" sticks. Double chocolate cauliette muffins. Cauliette lemon "rice" pilaf. Microwave ready. Steam in bag. NET WT/ POIDS NET 397g 14 OZ. Keep refrigerated. Perishable Washed and ready to eat. Healthy cooking made easy! Steaming is a healthy and convenient way to prepare fresh vegetables. Our innovative packaging allows you to steam these veggies in your microwave. Do not pierce bag. Place this side up, in microwave and heat for 2 minutes. Remove carefully as bag will be warm to the touch. Enjoy!